Yesterday in New Delhi National Investigation Agency has booked 11 Members of Hindu Extremist Group Sanatan Sanstha for doing Bomb Blast in Goa. 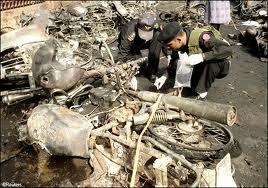 This Bomb blast took place last year in which 3 Muslims where killed. According to Indian Media 5 of these Members are arrested while others are absconding. This is the same Sanatan Sanstha whose two members where killed while making the bomb to blame it on Muslims in 2009. chargesheet against these terrorists is of 3000 Pages. Recently Indian Government has declared terrorists over 130 Organizations in which almost Hundred are Muslim while others are Sikh or Naxals. There is not a single Hindu Organizations that is banned by Indian Government among these 130 which shows biased face of Indian Government.